Although TerraCircle has Melanesia as its main geographical focus, the agency also works in Australia. For a recent Australian assignment, the task was to take a manual on sustainable living developed by the School of Behavioural Psychology at Murdoch University and localise it for a NSW readership. The result was a complete rewrite and update of information covering most if not all of the elements of sustainable urban life – energy, water, food, biodiversity, personal health, waste, transport, sustainability thinking and collaborative work in the community. 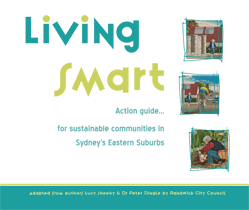 The Living Smart manual is given to participants of the popular, 24-hour course now being piloted by Randwick City Council’s Sustainability Education Officer. The course attracts a broad demographic that includes community leaders. Intervention in sustainability education and associated consultancy and production of media products, such as the Living Smart manual, signifies TerraCircle’s broadening of its approach to sustainable development. Making compost was the theme of TerraCircle’s first Australian work, a workshop that took place on Sydney’s North Shore for Ku-ring-gai Council. More followed. Sustainable development is Terracircle’s driving motivation when it comes to its main area of focus in Melanesia, while in Australia TerraCircle focuses on sustainable living. In places like the Solomon Islands – that as well as being the present geographic focus had been the earlier focus for those TerraCircle members who worked with an earlier international development agency, APACE (Appropriate Technology for Community and Environment), Tony Jansen, Peter Vail, Lisa McMurray and Russ Grayson – establishing sustainable systems for basic life needs such as food and livelihoods are important. Most Australians have access to these, so the emphasis here is how to live in a way that does not exceed the country’s capacity to support us. The Living Smart manual fills a niche in community education for sustainability for a sophisticated, up-to-date production that includes material to inform and motivate course participants. It reinforces the course focus on behaviour change and the interactive teaching style involves participants in developing solutions together. The course and manual include personal goal setting. Course participants go on site visits to see sustainability in action, talk with experts in areas such as water efficiency and energy efficient building design amd meet local, community-based sustainability groups. Throughout the course, there is plenty of opportunity for participsnts to discuss and share their own knowledge and experience. Being behaviour-change based, the course moves well beyond older and less effective approaches to education for sustainable living such as creating a sense of guilt about how people live – the ‘shame and blame’ approach – which is more likely to create resentment and resistance to change. Living Smart is far more than mere lecturing people as if they are empty vessels into which information is to be poured in the hope that its provision will somehow make people act on it, which only a few do. Knowledge doesn’t change behaviour. People first need to shift their assumptions and beliefs. Doing this will direct their thoughts, then their actions. This is the behaviour change approach that lies behind Living Smart. Localisation of the Living Smart manual is the work of TerraCircle’s editor Russ Grayson.